Germfree Modular Laboratories are used globally to support the wide range of operations traditionally carried out in conventional buildings. 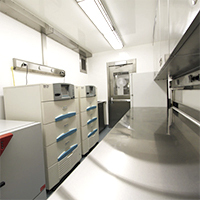 Our Modular Labs enhance or expand existing capabilities, allow faster deployment and maximum flexibility of operations. We offer a variety of platforms ranging from ISO containers, for deployment to remote locations, to completely integrated multi-use buildings. 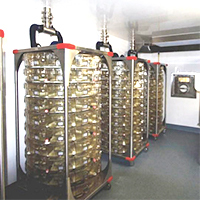 Our units meet any requirements for cGMP and aseptic demands as well any required level of bio-containment. 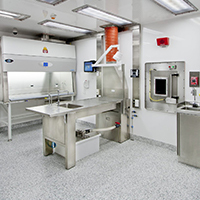 Germfree is the only company that designs, engineers and manufacturers all the critical primary containment equipment and secondary containment systems for modular BSL-3 and ABSL-3 facilities. We have built and installed turnkey ABSL-3 and BSL-3 laboratories globally. Germfree designs, engineers and manufactures turnkey Biological Safety Level 3 (BSL-3) Modular Laboratories. Our innovative solutions let you expand your existing operations or deliver new BSL-3 capabilities to your site in an accelerated timeline. We offer a variety of platforms ranging from ISO containers for deployment to remote locations, to completely integrated large multi-use buildings. Our manufacturing experience and expertise with biocontainment engineering controls assures an advanced and sustainable facility. We have placed fully commissioned CDC-NIH compliant BSL-3 labs into remote locations in Asia, Africa, the Caribbean and South America. Germfree’s BSL-2 and BSL-2+ labs provide the most practical approach to boosting international lab capacity. We utilize highly durable, intermodal ISO containers as the platform; multiple containers may be joined together for a larger space. All biosafety equipment and integrated systems are manufactured in our controlled factory environment. Our ISO-Lab2+™ fills a critical void in global public health as many regions lack suitable and sustainable laboratory capacity. This BSL-2+ or ‘BSL-2 Enhanced’ unit is effectively equipped to safely handle many current and emerging public health applications. They are energy efficient and engineered to match local resources. 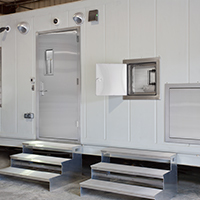 Germfree’s Shipping Container TB labs provide an ideal solution for the challenges encountered in many areas where a BSL lab is required for work with Tuberculosis. These modular labs are built into specialized ISO shipping containers making them easily transportable to any region of the world. They are complete laboratories that can be installed in even the most remote locations and quickly placed into operation. We coordinate all the details for your project through on-site installation, certification and maintenance training. BSL-4 and BSL-3-Ag are among the most demanding laboratory environments. These labs must meet rigorous standards in regard to engineering the primary and secondary containment systems. BSL-4 and BSL-3-Ag facilities also have a range of additional requirements relating to separation of facilities, structural durability, biosecurity, procedures and administrative controls. Germfree offers a single source solution for bio-containment projects. We are the only company that designs, engineers and manufactures all of the critical primary and secondary containment systems required for high containment labs. 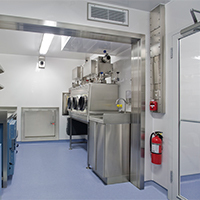 Animal Biological Safety Level 3 (ABSL-3) facilities have unique design and engineering requirements. These labs must meet all the rigorous specifications of a BSL-3 facility as well as additional requirements for properly housing and handling animals. ABSL-3 labs require advanced primary and secondary containment systems for handling any potential hazards to personnel or the environment. Additionally, the facility must be constructed so that it is highly durable, easily cleaned and meets all parameters for animal well-being. We have been manufacturing bio-containment systems for more than five decades. Germfree has delivered complete modular BSL-3 and ABSL-3 laboratories worldwide.